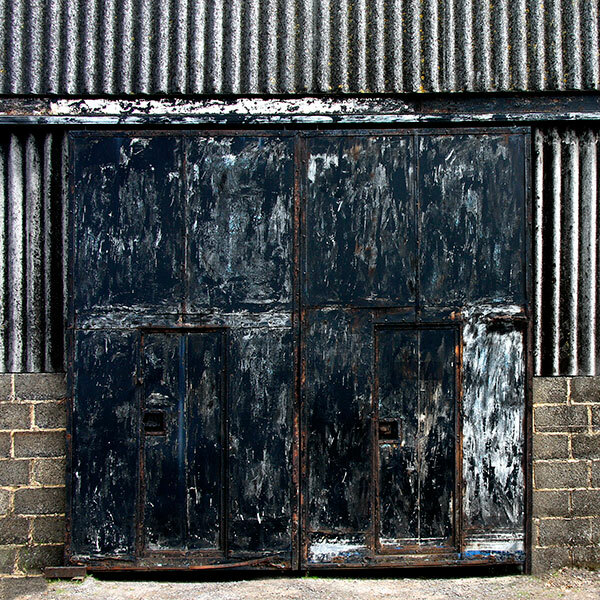 This gallery collects together photographs relatively small commercial and industrial doors made over a number of years through discovery rather than intent. 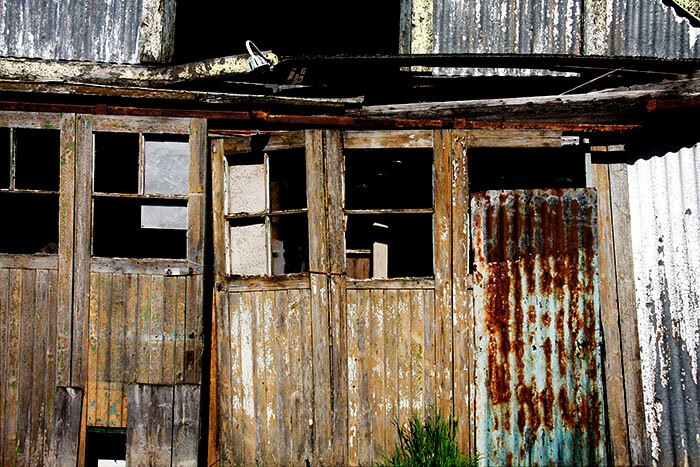 I’m uncertain as to the number of times I’ve driven past this long abandoned garage on my way to north-west Scotland. It may be that on the earliest journeys the business was still open for repairs and fuel. 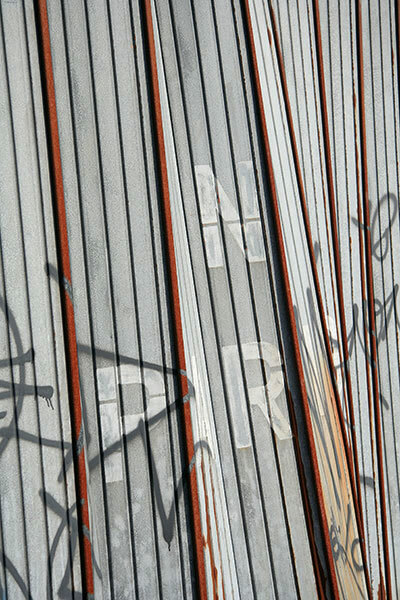 In afternoon sunshine this detail from the frontage has a rich mixture of shape, pattern, texture and colour across timber and corrugated iron. Stone barns and field walls are two of the many structural attractions in England’s Lake District. 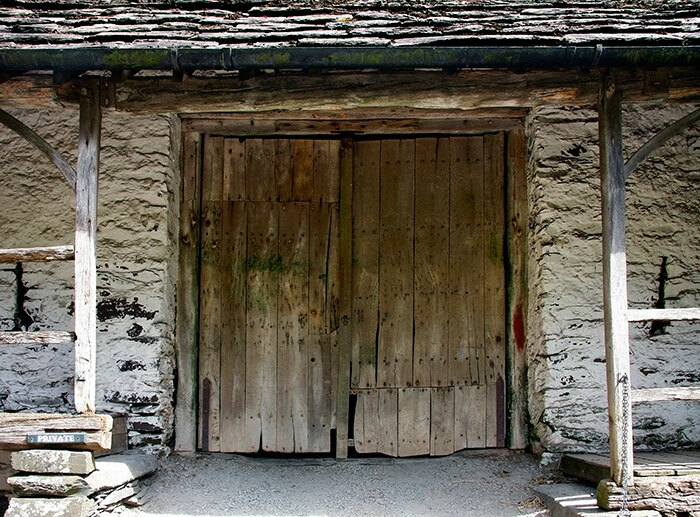 I was interested in looking at the many variations on a basic design of double doors set into a stone barn topped by a slate roof. Some, like this somewhat dusty example, are whitewashed in contrast to the many left in their native stone. Doors are often painted but I liked this pair in dusty and weathered natural oak. The board patches, worn edges and hinge sag on both of them subtly emphasises their long service. Steel rails can still be found on the track bed of the former Northern Pacific Prairie Line running on Hood Street to the Tacoma waterfront. Warehouses were built alongside, and many have been restored and converted to contain new functions. The University of Washington Tacoma occupies some of them and its campus embraces a stretch of the tracks now developed as a linear park, the Prairie Line Trail. 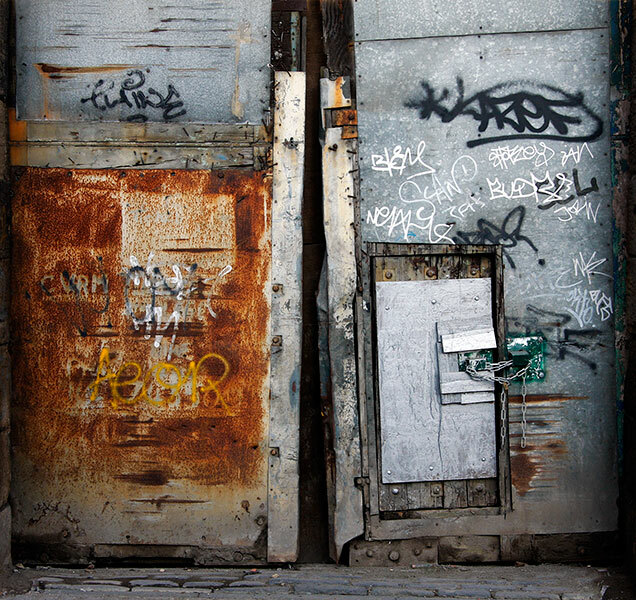 This pair of doors remains un-gentrified. The Pennine Hills form a backbone to England extending north from Derbyshire to Tynedale in north-east England. The high ground and wild moorland continues through the Northumberland National Park into the Cheviot Hills. Ramblers can follow the 267 miles of the Pennine Way from Edale in Derbyshire to Kirk Yetholm, a village just across the border into Scotland. Sparsely populated, the Pennines once supported extensive lead mining, quarrying and associated rural industries: farming continues. 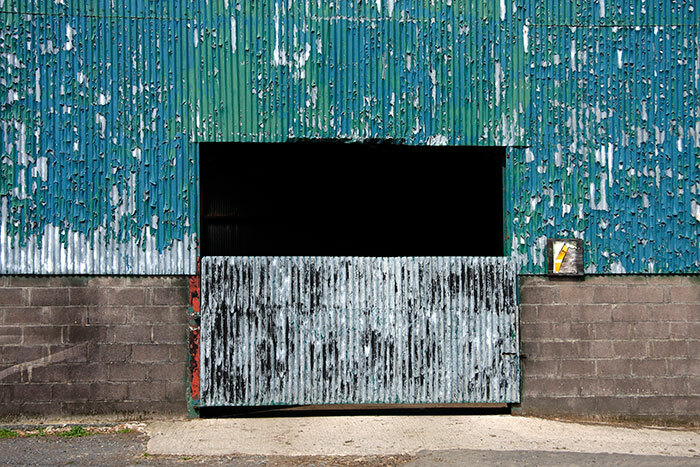 Further north and into Northumberland this cowshed is another variation on a common basic design featuring corrugated iron as a major structural material. 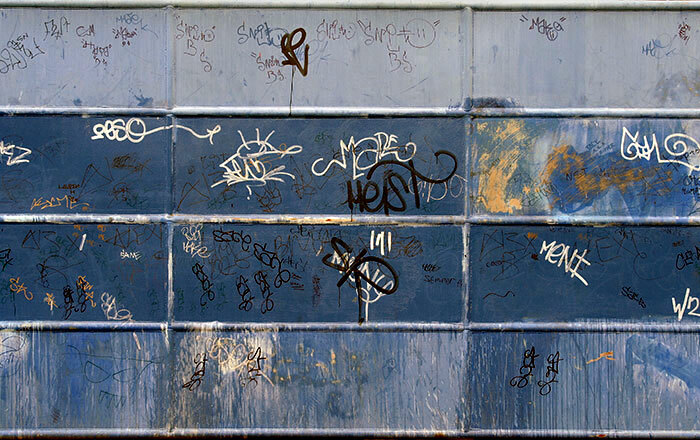 The assemblage of rectangles, the linear patterns of the corrugated iron and the texture of flaking paint appealed. 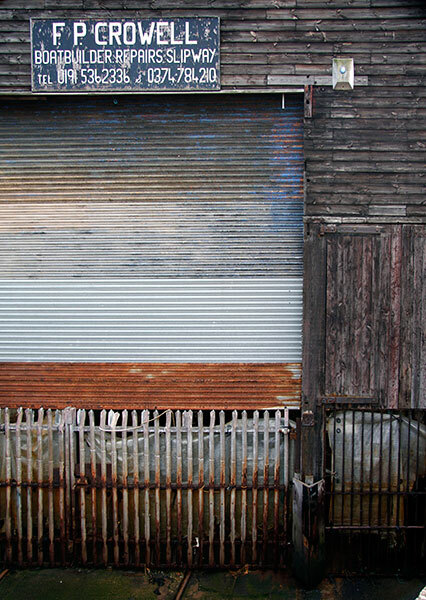 The CORRUGATED IRON GALLERY is devoted to eighteen examples of that material in rust and decay. Heading home from a Scottish holiday we stopped briefly in a small town. 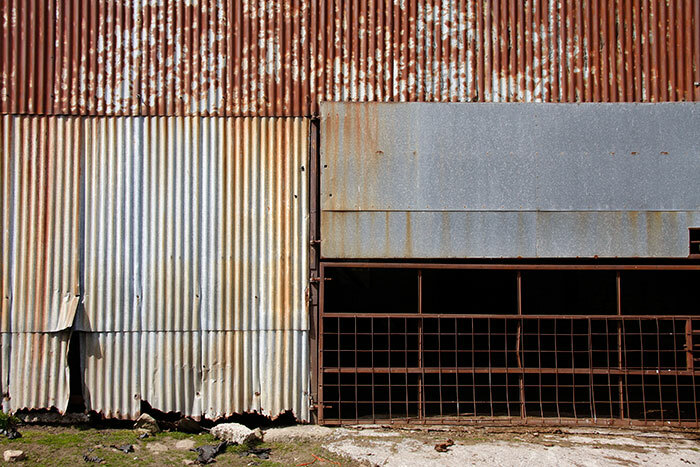 It was perhaps inevitable that a record should be made of yet another corrugated iron clad industrial building. The red plastic refuse bin acts almost as an exclamation mark. With hindsight I should have looked more closely at the window framing the interior still life as well as details from the metal structure. The Hawthorn Leslie Shipyard operated on the south bank of the River Tyne at Hebburn. When I took this and other photographs it was a shadow from the past. Some fire damaged offices, a large engineering building and crumbling slipways remained. All tall cranes had gone and much scrap metal and demolition debris was strewn around. This large gate some eight feet high closed off one of the street entrances. Evolving individually since the 1850s and operating adjacent yards Wigham Richardson & Co. Ltd and C.S. Swan Hunter Ltd amalgamated in 1903 to create Swan Hunter & Wigham Richardson Ltd. Rapid acquisitions of other yards and engineering works established a powerful shipbuilding consortium on the River Tyne. Credited with building some1,600 naval, cargo and passenger ships the Company encountered increasing financial difficulties at the end of the twentieth century. 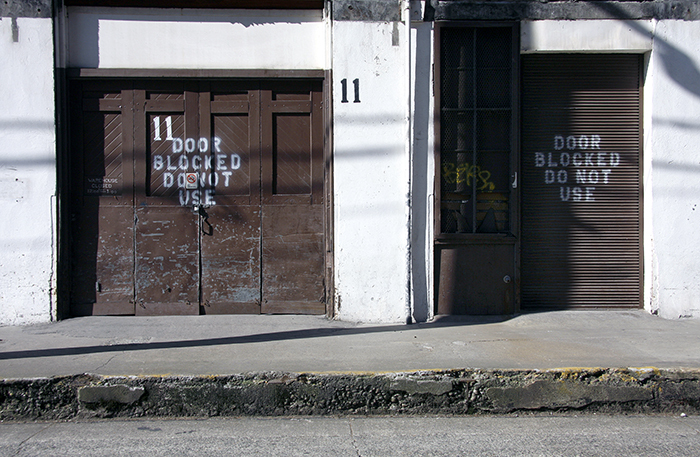 This folding door once gave access to a workshop: perspectives on NO PARKING and graffiti lettering intrigued. The yard eventually closed and much of its machinery, many of its cranes and a floating dry dock were sold and shipped to India. Over 2007, 2008 and 2009 I photographed the demolition of a once great shipbuilding centre. Two galleries, A WAKE FOR SWAN HUNTER 1 and A WAKE FOR SWAN HUNTER 2 contain a selection from those images. IMAGE 04 in the second set shows this door standing within its heavy steel frame amongst wild flowers growing amidst dereliction and backed by tall cranes. This archway is one of a series set into the nineteenth century structure below a railway goods depot in Newcastle upon Tyne. There are many similar structures in the area used to house a wide range of businesses. Some have been modernised and converted for retail use, others house motor and engineering firms whilst others like this sheltered less attractive activities. Renovation and conversion of the depot above included these spaces below and the installation of a new and matching series of doors. I thought it a very fine abstract artwork, sadly no more. At least I have a record of the idiosyncratic visual and material qualities in the accumulations of patches and freelance lettering. 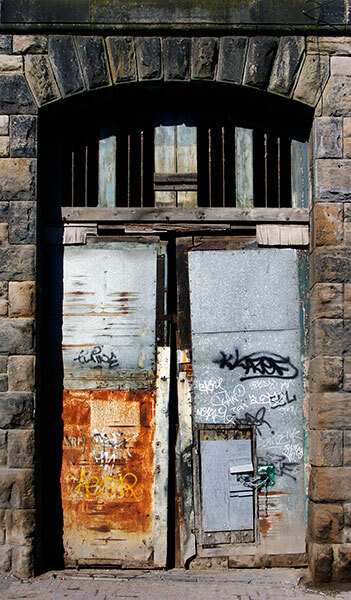 The building’s formal geometry incorporating a variety of materials is offset by the irregularities in the in the eroding paint applied to the doors. The narrow metal edgings framings were punctuated by the regularity of the domed coach bolts pinning them to the door panels. This image was made during the extensive restoration and repair of The Central pub in Gateshead. Built around 1854 the building stands on a narrow triangular site. Imagine a coffin shaped floor plan but with one long side set straight: visually it has five ‘front’ facades. Visit if in town or across the river in Newcastle. At street level the unusually detailed stonework is pierced by tall round topped windows containing etched and coloured glass. The interior spaces contain decorative details and fine woodwork from the past. 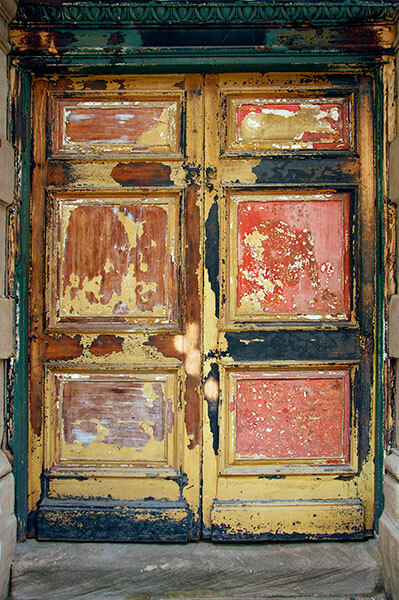 This image shows layers of paint being stripped from one of the five exterior doors. 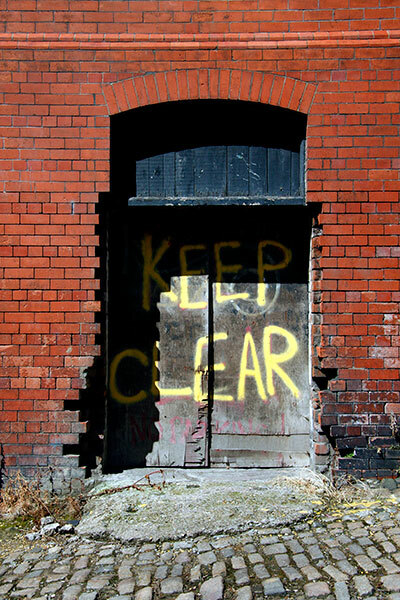 A diminishing number of derelict buildings remain in a small area south of the Central Station in Newcastle upon Tyne. Others have been restored or demolished and replaced with a mixture of domestic and commercial structures. This one was built in 1901 using high quality bricks fired to a rich red. They are in marked contrast to the crude lettering on the shabby plywood covering the door, the rough concrete and spreading granite setts below. 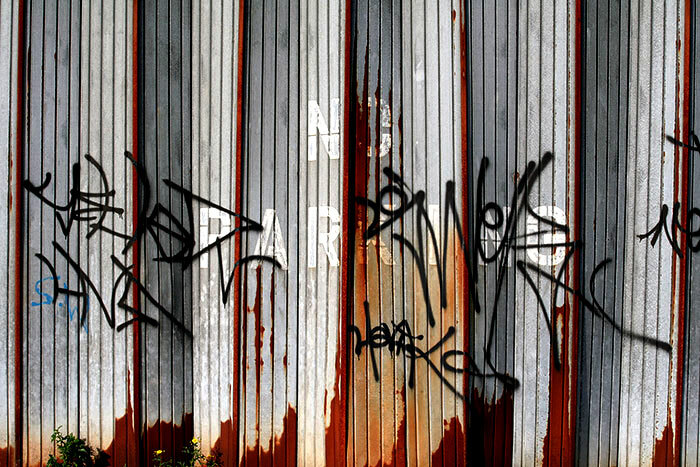 The ten o’clock July sunshine created a strong angular shadow within the opening and across the graffiti. I visited the interior of this boat-building workshop a while before the owner retired and closed what was thought to be the last wooden boat building business between South Northumberland and Yorkshire. 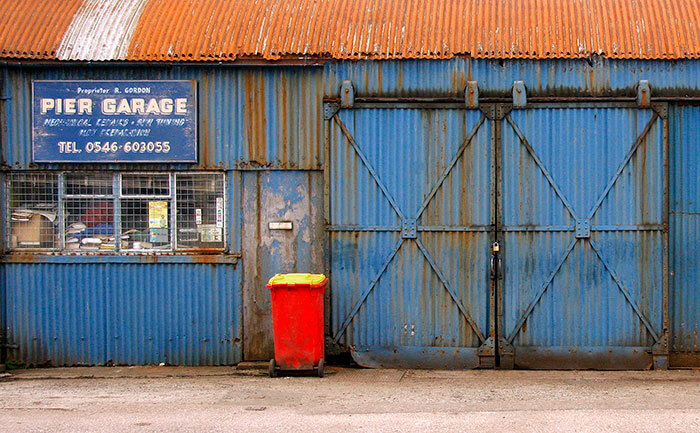 In 2016 the structure was acquired by the next-door North East Maritime Trust, adding working space and slipway access into the River Tyne to their facilities. The Trust works to preserve historic wooden vessels and the craftsmen skills involved Their website carries details of activities, events and visiting times. 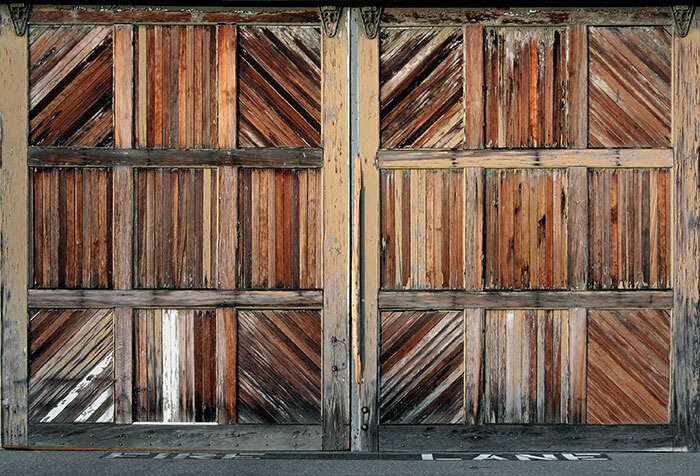 Walking north from the Ferry Building on the Embarcadero I passed this pair of large rail hung timber doors at the entrance to Pier 17. The SAN FRANCISO BY THE BAY BRIDGE gallery contains photographs of neighbouring buildings, pier details and the Bridge itself. Sailing on Chicago Water Taxis is a relaxing way of looking at architecture in The Loop and its fringes. This and the following image were made at West 18th Street, the southerly terminus at the Ping Tom Memorial Park. A long, low, flat roofed brick building carried CONTINENTAL PAPER GRADING CO in what was once bright white paint. 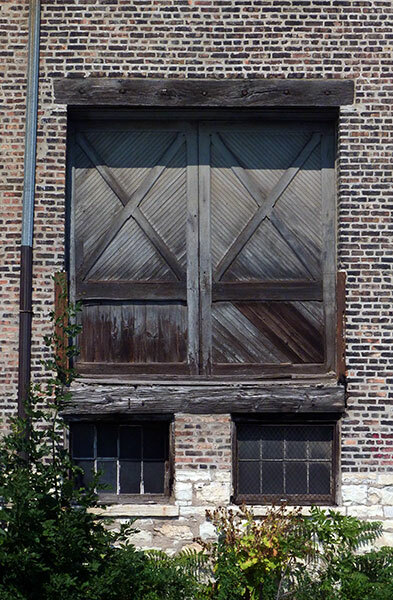 Four pairs of doors open on the river frontage, their dark seemingly unpainted timbers echoing the richly dark brown tones of the brickwork. 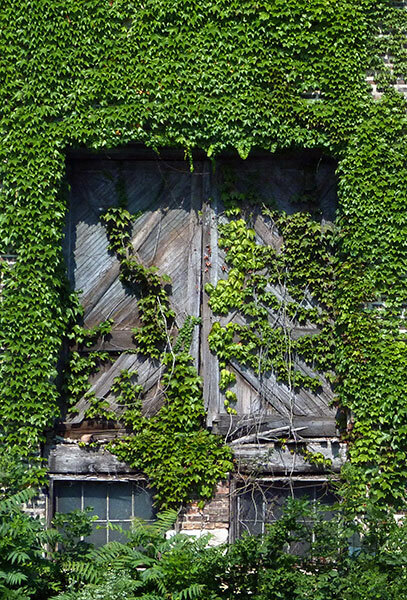 The green of the climber leaves was in vivid contrast to the sombre tones of the underlying brickwork. The Chicago Architecture Foundation river cruise boats are larger and offer better views enhanced by expert architectural commentary. The Water Taxis sail similar routes and are ideal for repeat viewing or if a more economical fare is preferred: an all-day pass is an attractive buy.